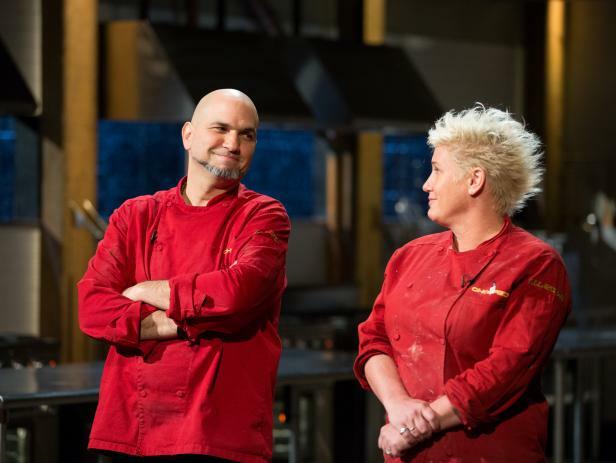 Guest Chef Anne Burrell, wins against competitor Michael Psilakis, during the All Star Tournament Finale, as seen on Food Networkâs Chopped, Season 24. 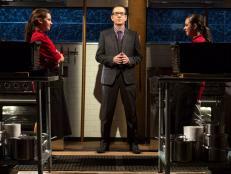 Five weeks ago 16 celebrated chefs entered Season 4 of the Chopped All-Stars tournament for a chance to walk away with the title of champion and the largest sum in the history of the show, $75,000 for a charity of their choice. 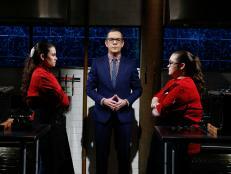 Four preliminary rounds whittled down the competitors to four: Art Smith, Anne Burrell, Michael Psilakis and Jet Tila. In their earlier rounds, these four unlocked the mysteries of the basket, creating courses that earned them a place in the finale. All of them brought their A-game to the final battle, but one outmaneuvered them all. FN Dish has the exclusive interview with the champion. Going into the final battle, Anne Burrell once again let the baskets dictate the direction of her dishes. And as a seasoned professional who has competed previously, in Season 2, she knows that on Chopped the baskets are king. Making sure the ingredients speak for themselves in every dish is what makes a champion. She relied on a mix of technical strengths like making pasta from scratch, and continued to cook within her comfort zone, i.e., with a rustic touch. She produced a potato salad with fish cheeks for the appetizer, a seafood raviolo in a sea urchin sauce for an entree and three frozen treats for dessert. These three courses sealed her fate and earned her the All-Stars Champion title as well as $75,000 for Juvenile Diabetes Research Foundation. FN Dish: How does it feel to win today? AB: It's thrilling and exciting and, um, I have to say … Chopped is the hardest show to do, and to come out on top feels really good. Did anything feel different about competing this time versus your previous battle? AB: Different opponents, amazing chefs. I mean they're, again, a group of amazing chefs, but other than that, no. You know, nutty baskets but still a lot of fun. What was your mindset like today? AB: Pretty much how it is whenever I do a competition like that: I want to win. You had some trouble during the entree round. How did you deal with it? AB: Oh well, I mean, the seafood tower fell over and so it flooded my whole table, and so I just tried to move over. And then they were telling me I'm not allowed to go on the other space, and it was kind of a disaster in that way. And, like, my place was a mess, so, you know, that gets me bunched up. 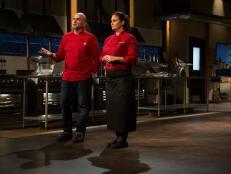 After expecting the worst from the judges, how were you feeling when you got positive feedback for that dish? What made you think you would be chopped for that? AB: Because all I could look at that dish and see [were] all the faults and flaws with it rather than [the positives], you know. And … when you're doing this, you don't get to eat the dish. You don't get to taste the dish all together, so, you know, like, you taste all the parts and hope all the parts add up to something good. … That it was so well received was truly exciting. Were you worried about your dessert not being a united dish, knowing that it's a common criticism? AB: Well, I mean, it was my approach, and I thought it was a clever and creative one. So if they didn't see it the way I did, I would have been disappointed, but it was also [that] I quite honestly still can't really think of another thing to do with that basket. How will it feel to give your charity the $75,000 check? AB: Well, it will be amazing for them to receive that money, and hopefully, you know, it will benefit my nephew Luke.